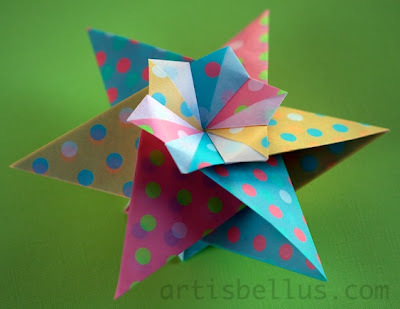 Franziska is a beautiful origami star designed by Carmen Sprung. The diagrams are available in her book, 21 Origami Sterne, ISBN 978-3000365713 (in German). The star is built with 6 modules, which makes it three dimensional, and it looks the same if turn it over, making it perfect as a hanging ornament. I folded the star with 6" (150 mm) squares of patterned origami paper.